» Why no 14 pin AVRs with PLL? Why no 14 pin AVRs with PLL? Hmm...been digging and looking for a 14 pin AVR to generate one 150KHz-ish type PWM (8 bit res, 0-255). I can find 8 pin parts, like tiny85, or 20 pin parts like tiny261 with the high-freq PLL. I need about 9 real pins to work with (not counting gnd & vcc, avcc etc) for leds, switches, etc. Might have to use the 20 pin tiny261 and pay a bit more (need the lowest cost--even $0.15 is a big deal). Thought about using an 8 pin with a HC595 expander, but that is probably not a cost-saver. Of course, the mech guys will toss in $5 worth of rubber feet & not think twice. I used the header search function in the studio directory to find PLLSCR (parts that have the PLL register). If I overlooked any such 14 pin parts, please let me know...not sure why they'd not offer one in 14 pins. What is the real difference between 14 and 20 pin? If you go to the most densely packed pins package then surely it is a question of a millimetre or less? I quick answer no big customers have asked for it. And It looks like many of the 14 pin chips are 20 pin die's in a smaller house. What is the real difference between 14 and 20 pin? Something like the 14-pin tiny44 is 64 cents at Digikey (in volume)......the tiny261 is a whopping $1.12...need the lowest possible cost for regularly stocked parts (they do have some clearance sale parts). What volume of '261A would that be? Quantity 1? It is a bit misleading to price just based on pin count, and not features, capacities, and peripherals. As you are finding out, eh? Better vote with your feet and find another architecture that will satisfy your needs. How many are you making? I see a bit more now; it is the -MU package, otherwise the '44 is more expensive than '216. ...but certainly not twice as much as your apples-and-oranges analysis. I thought that these days the cheapest AVR's are from Microchip Direct. IIRC, Digi-Key's sales can be better than microchipDIRECT. ATTINY261A-SUR Is $1.13, compared to our present $0.64 cent soic tiny 44--a big % jump! 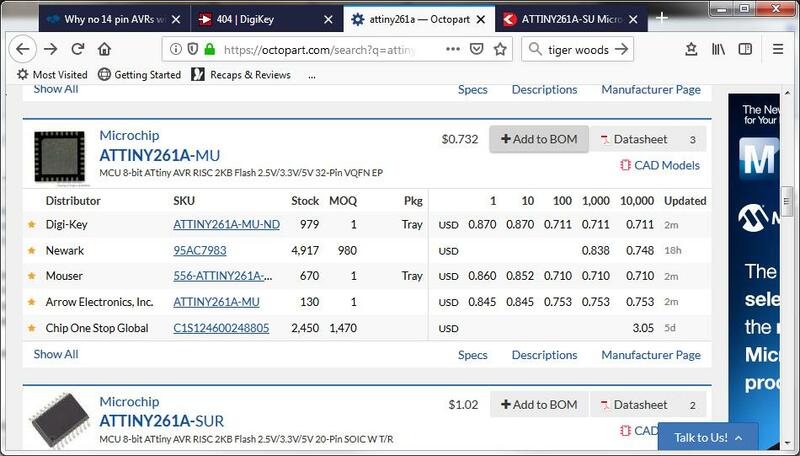 ATTINY261A-SU is $0.91 at digikey ...why is an "R" worth 22 cents each??!? For some reason looks like QFN is less, though we prefer soic. I suppose pricing is mostly a dart-shoot & shortcut to an ulcer. 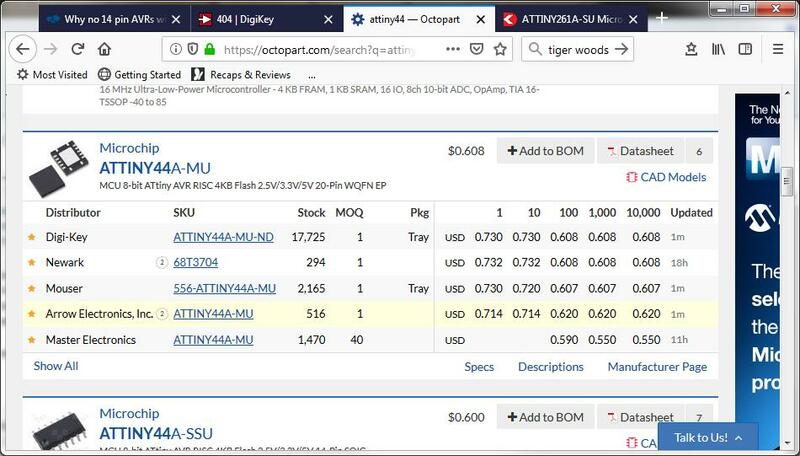 Yeah, they can mislead...digikey can have 67 of something in stock at cut-rate 38 cents (sounds great), then you design in, then 2 months later your assembly house says their purchasing has the lowest production quote for $1.11/ea & you say WHAT? The 38 cent price was not for any future purchases, just a clear-out price. I think that comes down to volumes, and the biggest sales are in QFN packages these days, so SO14N is a smaller market (and more board area). I think one reason SO14N (1.27mm) even still exists, is it can be used on single side PCB, and can go down wave soldering lines. to reduce the risk of cracked solder joints (temperature cycling) though underfill can be added to the PCBA process for QFN. And it works well with my soldering iron. That underfill is interesting; the chips are too small for my taste...we have plenty of space. Why do you think? It costs more for the extra step to put to the reel format? I think that's crazy...you can get resistors on a reel and they are only pennies (or a fraction of a penny), or opamps, and also very cheap. So no way, is the extra cost of the processor to get put on a reel almost a quarter each. Suit yourself; you obviously know better than I do. T&R are custom reel sizes less then whole reels! So your paying the labor cost for someone to provide you with a less than full reel. Compare the whole reel price! At that point I would go straight to Microchip direct and place an order there and ask them to quote pre-programming the parts for you. Better vote with your feet and find another architecture that will satisfy your needs. Great advice. I did that when I could not get a price break even through a rep. Ended up using a PIC-quivalent for 1/5 the price of the PIC. When it comes to economics of a product, I have learned that none of the manufacturers give the discounts they used to. Want a nice price, order 100k parts. Want a REAL nice price, order 1million. Still doesn't make total sense, since this is the biggest purchase option method Digikey has. Seems like anything else, like bagging them by hand, putting them in a bunch of separate tubes, or other non-reel methods would be the pricier way. A 20+ cent price difference--wow! I suppose that's just the starting point for negotiations. Maybe someday they'll offer a 14pin version with high speed PWM. Hmm, I'm not seeing the claimed difference, but there is a LOT of variation across packages here, some suggest 'go away' pricing is being applied. 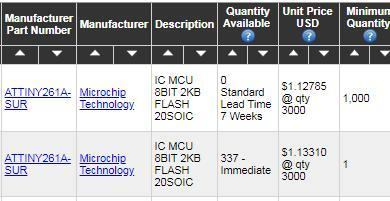 The microchip direct pricing is a little bit more sane.. (5k+) - you need to watch for Digikey 'clear stock line' prices, not really flagged in any way. Maybe microchip direct is the way to go! Careful not design to in any "clearance parts" ...then find out in a few months they are 2x the price & get everyone fumed up.